The weather tomorrow doesn't look good at all. Cloudy, drizzly, and cold doesn't make for a pleasant ride. I will hold off until tomorrow morning to make the GO / STOP decision, but unless the weather changes significantly, we won't go. It will be a chilly start. After more than a week off, you would think I would be caught up on planning bike rides, but .... In my defense, I've driven to Haverford, PA and Bar Harbor, ME, and helped my son build a pipe organ for his senior project. Anyhow, the weather on Monday is looking pretty nice. It should be Sunny and near 50 in the morning and near 60 in the afternoon. The rest of the week is looking rather iffy at this point. The plan is to explore the Mass Central Rail Trail in the morning, have lunch at Village Pizza, and explore the Wachusett Reservoir and Dam in the afternoon. 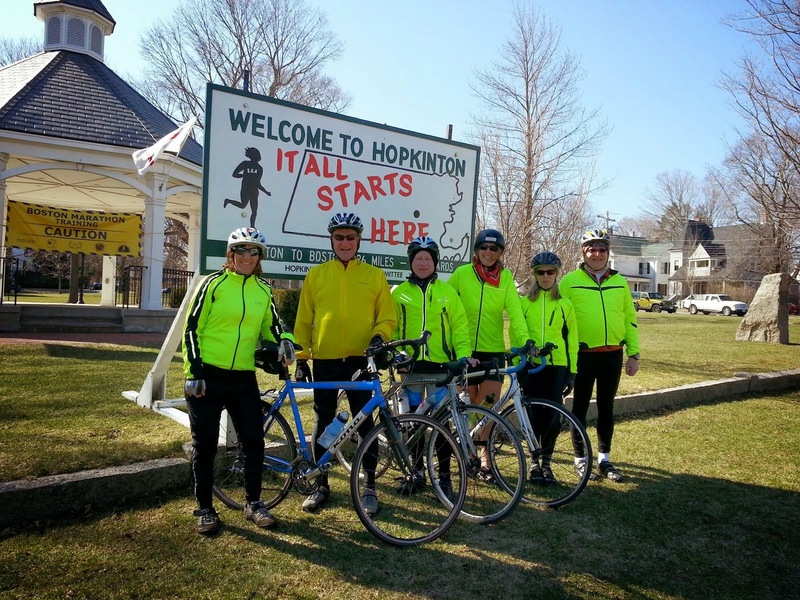 The Morning Recreation Ride will explore the Mass Central Rail Trail to Holden. Elevation Gain - 500 feet (moderate). NOTE: MapMyRide changed the way it calculates elevation gain. Don't be intimidated. The Afternoon Fitness Ride will ride to the Wachusett Reservoir and Dam. Well, the good news is that it's supposed to be Sunny tomorrow. The bad news is that it's supposed to SNOW tonight. The temperature should be just above freezing tomorrow morning, but the windchill will be about 20 degrees. If the forecast is a even 50% correct, then there is a 100% chance that I will postpone the ride before 8:00 AM tomorrow morning. Unpaved - A few miles of smooth gravel. Our 21st season is off to a great start, and Monday is looking like another great day! It should be 60s and Partly Cloudy and the morning, and 70s and still Partly Cloudy in the afternoon. The wind will pick up in the afternoon though. There are no Friday rides due to Good Friday. The morning Recreation Ride is TBD at this point. Pond Street was washed out by the flooding a few weeks ago, so I have to make a new route. The afternoon Fitness Ride features Massapoag Pond and the "Field of Dreams". Route Map - Dunstable - Westford - Tyngsboro. AR Index - Roughly equal to 18 flat. paved miles. The great biking weather (hopefully) continues! On Friday, it should quit raining by 9:00 AM and be Cloudy and mid 50s when we leave and Partly Cloudy mid 60s in the afternoon. Here is a picture from our Wednesday adventure. The morning Fitness Ride will explore some quiet Carlisle backroads on our way to the Old North Bridge in Concord (porcelain!). There could be some water/mud at Old North Bridge. The YUMMY lunch will be at Fern's Country Store (porcelain for customers). The afternoon Recreation Ride will ride to Great Brook Farm State Park (porcelain!) and return through scenic backroads in Carlisle. I have a route and a lunch spot. I think it will be an EPIC ride! Starting Point Map - Hopkinton Center. AR Index - roughly equal to 46 flat, smooth miles. The weather is looking really nice tomorrow, Mostly Sunny, 50s, but windy in the afternoon. The original route I planned with the Upper Charles River Rail Trail was flooded this afternoon from the rain last night, so I planned an alternate route from Hopkinton. We will still follow the first few miles of the Marathon Route before we go to a much more scenic area. Hopkinton is a pretty little town, but it is at the top of the hill, so it will be easy in the morning, but a climb to get back. I haven't finished the route yet, but it will be around 30 miles with about 1500 feet of climbing according to the new MapMyRide calculation. I would guess it will be similar to Monday afternoon's ride except twice as far. As promised, here are the details for tomorrow, even though I have more chauffeuring to do tonight. The weather for tomorrow looks pretty good, warmer but cloudier than today. It should be around 50 degrees when we leave in the morning and 60 degrees by afternoon. The morning Recreation Ride will visit the rapids on the Nashua River. They should be pretty high after the recent rain and snow melt. We should return by 2:30PM. AR Index - Roughly equal to 21 flat, smooth miles. I'm still not running like a well oiled AdventuRide machine yet, even though Carole and I have done 55 miles already this season. I will get you all the ride details after I finish my chauffeur duties for the day. So Monday we will start in East Pepperell Center and ride up to the Nashua River rapids in the morning. I haven't figured out the afternoon yet. I just got back from exploring around Hopkinton so we can ride a bit of the Marathon route on Wednesday and then check out the new Upper Charles River Rail Trail on the way back. Friday I am planning to ride around Carlisle, Great Brook Farm, Old North Bridge, etc. Stay tuned for more info shortly. It's a bit chilly, bring something warm. Unfortunately the weather will not be as nice as it was today. It will be more like what we had on Wednesday, pleasant but a bit chilly. Don't miss the YUMMY lunch at Filho's. I haven't figured out the afternoon Recreation Ride yet because the rail trail is snow covered north of Sand Hill Road. I'll come up with something though. Unpaved - Yes! We may find some mud and snow along the way. Unpaved - Possible Mud and Snow. AR Index - roughly equal to 14 (or less) flat, smooth miles. It's chilly. Bring something warm. The weather is looking very nice tomorrow. Partly Sunny, little wind, and highs in the low 50s. It will be a bit chilly in the morning, so be prepared.